After three decades, the municipality of Groningen was ready to review its policy for the design of public space. Urban planner Jaco Kalfsbeek and programme manager Gavin van Osnabrugge – who both work for the municipality of Groningen – explain how flexibility is the central tenet in the new design guide and in the city centre itself. In the framework of that process, the municipality invited STIPO to organise a three-day masterclass called ‘Placemaking in Groningen’ in the summer of 2016. 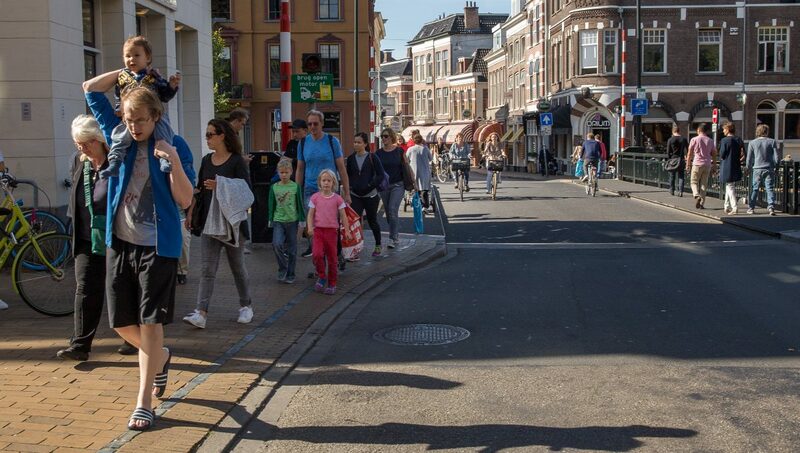 It gave colleagues at the municipality an opportunity to gain experience in thinking about the city centre as a system, in analysing locations and in applying strategies to involve users (residents, entrepreneurs and visitors) in the development. 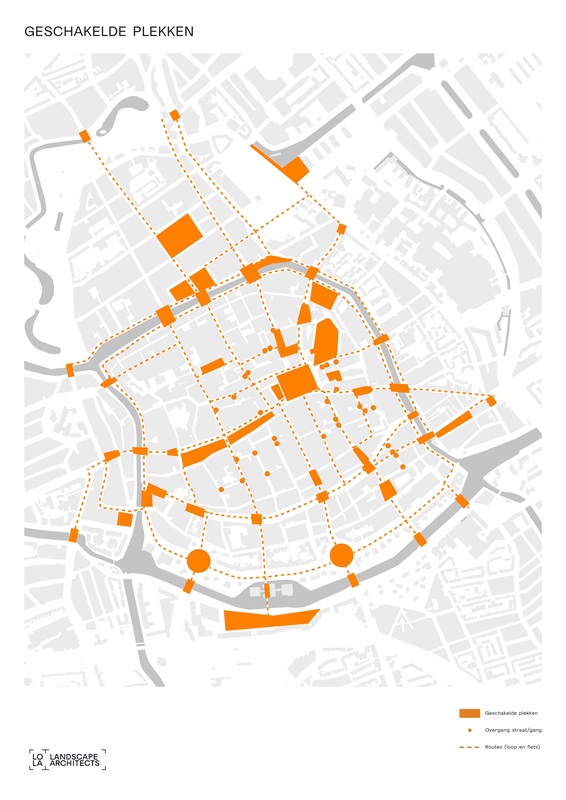 The outcome of the masterclass was the foundation upon which the municipality of Groningen and LOLA Landscape Architects developed the new design guide for the city centre (see box). 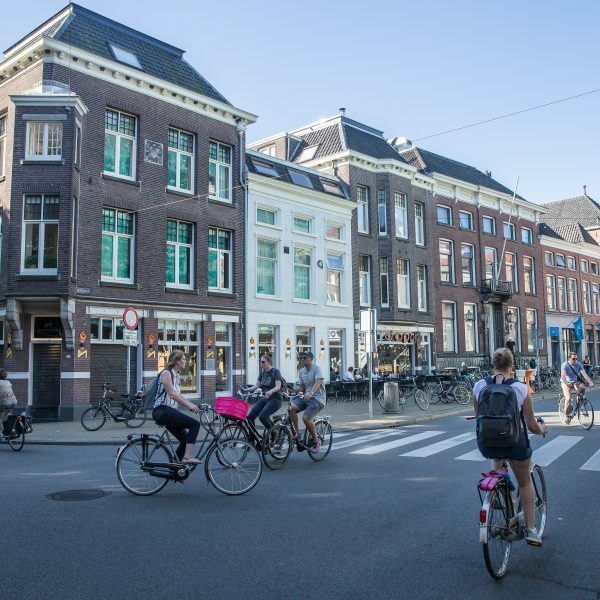 ‘We know from previous experiments – in Folkingestraat, for example – that shared space works when alternated with the flow of traffic,’ Kalfsbeek says. ‘When it’s busy, the cyclist will wonder: “hey, where’s my space?” And in this “confusion”, he’ll cycle very slowly, get off, or choose a different route. That’s what we’re looking for: we want to create a feeling that prompts people to make those kinds of decisions instead of placing a sign that bans cyclists in these kinds of streets on Saturdays, for example. For the development of the new guide, it was important to first analyse how the city actually works. That produced a few standard measurements, such as a (hybrid) driving lane about 3.5 metres wide for emergency services, heavy goods traffic and cyclists, and an obstacle-free space for pedestrians about 2.5 metres wide. Together, these two determine whether there’s any remaining space, and if so, how much space will be left over for the sidewalks. The emphasis is on freeing as much space as possible for pedestrians. The fact that the streets have not been asphalted and have no kerbs underscores once again the priority given to pedestrians. This design guide is expressly not a handbook that prescribes how and what should be designed. Rather, it’s a guide containing basic choices. Inspiring examples and design principles ensure that one doesn’t have to keep reinventing the wheel. The provided frameworks guarantee cohesion and recognisability in the city centre, but they also provide sufficient space for streets and neighbourhoods to create their own identity. The guide presents design principles, areas of concern and emphases for each type of street or square. The actual implementation can then start to take shape in partnership with local residents and other stakeholders.